Proof that the Explorers completed this walk tonight. We picked up where we left off last time – halfway between Barton’s Cross and Southwick then proceeded to Denmead, in the dark. In charge of navigation was our intrepid Explorer Leader Simon. 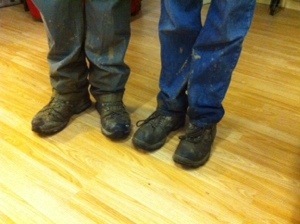 We trekked over hill and dale and were waist-deep in mud at some points (OK ankle deep). Creech Wood was the real challenge as for nearly an hour we struggled through huge deep mud patches and many fallen trees. Still, Denmead chippy beckoned and the pace quickly picked up once we hit the road. We used some old-school technology called ‘maps’ and a ‘compass’ which we had to read by torchlight! No GPS devices were involved!